Aerosol particles in the 0.1 to 1.0m diameter range have the highest efficiency per unit mass for optical interactions with incoming solar radiation due to the similarity of particle size and radiation wavelength. Sulphate aerosols and organic matter (Table 6.6) are therefore most effective at scattering and absorbing the short-wave radiation, with the effect of negative radiative forcing on the climate system (see sections 1.2.4 and 2.6.5). The negative radiative forcing due to large injections of sulphate aerosol precursors into the stratosphere from volcanic eruptions is well known (Sear et al., 1987). 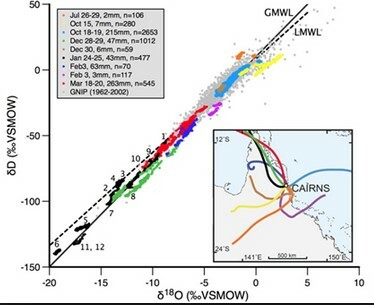 The major contributions to the anthropogenic component of the aerosol optical depth arise from sulphates produced from sulphur dioxide released during fossil fuel combustion and from organics released by biomass burning. To date, estimations of global negative forcing associated with anthropogenic aerosols are based on a number of modelling studies, due primarily to a lack of observational data. 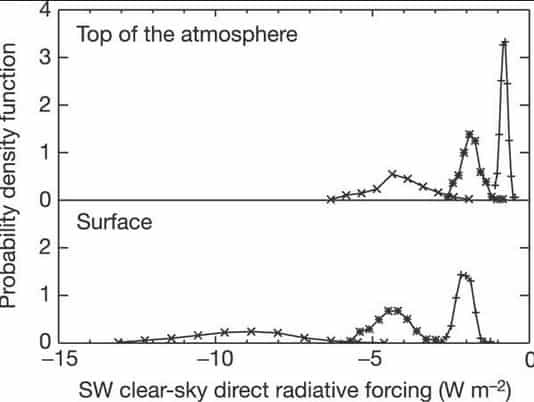 Using a aerosol radiative-convective model, Charlson et al. (1992) obtained a figure of -0.6 Wm-2 for direct global radiative forcing due to anthropogenic sulphate alone, whilst Kiehl & Brigleb (1993) calculated a value of -0.3Wm-2 for the Earth, and -0.43Wm-2 for the Northern Hemisphere. Figure 6.8 shows the geographic distribution of annual mean direct radiative forcing (Wm-2) from anthropogenic sulphate aerosols. The regionality of the forcing, due to localised emission sources and the short lifetimes of tropospheric sulphate aerosols, is clearly noticeable. Other model-calculated values for direct global radiative forcing due to sulphate aerosols include -0.25Wm-2 (Hansen at al., 1993) and -0.9Wm-2 (Taylor & Penner, 1994). Such a large sensitivity of the results of these simulations clearly indicate the need for more observational data on the chemical and physical properties of aerosols as well as more refined sulphate distribution calculations. 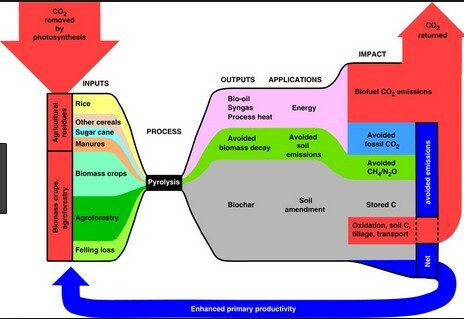 The effects of aerosols emitted as a result of biomass burning has received much less attention and global estimates of radiative forcing due to this source are subject to considerable uncertainty. The direct global-mean radiative forcing since pre-industrial times may lie in the range -0.05 to -0.6Wm-2 (Shine et al., 1995).